I'll eat them any time of year, but to my mind raw oysters and winter are a perfect pairing. And I'm not fussy about the beverage to accompany them, whether white, bubbly, pink, hoppy or of the cocktail persuasion…Bloody Mary, anyone? 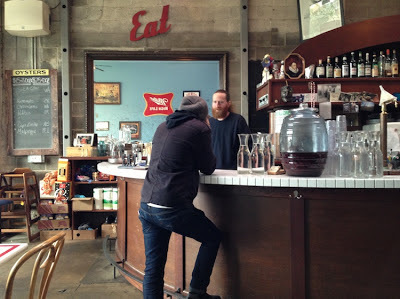 So during these cold(er) months I'm dedicating myself to uncovering some of Portland's better places to slurp some bivalves, both the well-known and those that are more under-the-oyster bed. Counter-clockwise from 1 o'clock: Seacow, Kumamoto, Chelsea Green, Petites, Cape Breton, Malpeque. When it came to picking the first spot to start this odyssey with my equally bivalve-obsessed friend, Michele, we settled on EaT, An Oyster Bar on North Williams Avenue. Dedicated to the seafood-bejeweled culture of New Orleans, EaT is known as a mecca for the fresh product and seemed like the right place to lay the foundation for our explorations. We sat down to ponder the offerings over their very cute 12-oz. mugs of beer, the perfect size to sip over a dozen mollusks. Lucky for us there were six oysters on the board, two from Washington, two from Oregon and, oddly, two from Eastern Canada, which just the right amount to sample one apiece and compare notes. Seacow (Washington): Medium-sized, tender but with a sweet, meaty chew. Nice and briny. Kumamoto (Oregon): Small and sweet with a creamy texture that still had some chew to it. A longtime favorite. Chelsea Green (Washington): Tiny (smaller than Kumamotos! ), briny and sweet, these were impressive. Like the Seacows, they have a meaty texture. Definitely the winners on the board. 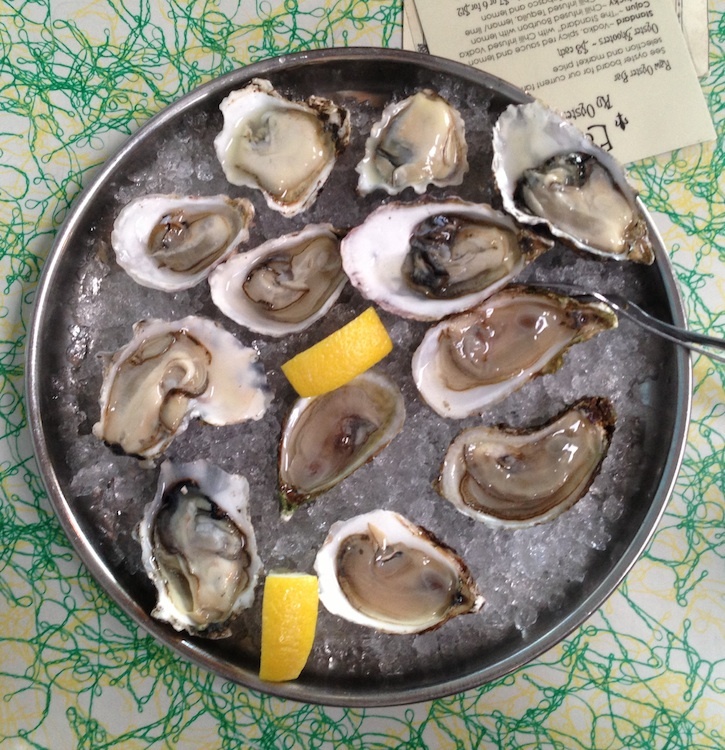 Petites (Oregon): Medium-sized with a super mild flavor, meaty texture and good brininess. 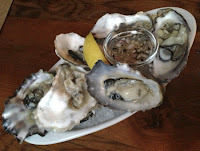 Cape Breton (Nova Scotia): Super briny/salty, but with a lingering sweetness. A tougher texture than the others, we wondered if it was because they came from so far away. Malpeque (Prince Edward Island): Like the Cape Bretons, very briny but a little less chewy. Nice if you like salty. Also not as plump as the NW oysters…again, true to type or too much travel? Since we were there to taste the oysters themselves, the proffered lemon wedges remained unsqueezed. We came to the conclusion that we need to come back soon and have a dozen Chelsea Greens each during EaT's happy hour when oysters are a buck apiece, a truly great deal. Details: EaT, An Oyster Bar, 3808 N Williams Ave. 503-281-1222. It just so happened that a day or two after the sampling at EaT, Dave and I decided to pause during what we euphemistically call The Running of the Errands to have a beer at Interurban on North Mississippi. 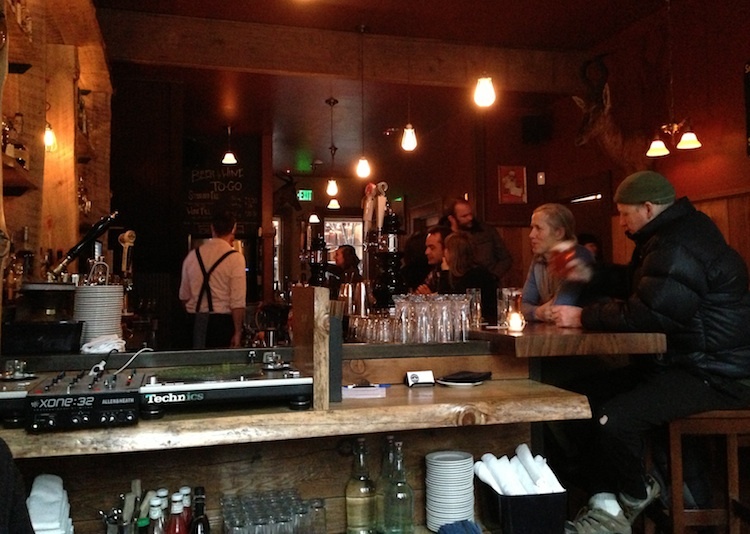 Their list, though not long, is very well-curated and the cozy, log cabin-like bar feels just right on chilly winter days. From left to right: Denman Island, Pearl Bay, Buckley Bay. Dave's fondness for raw oysters rivals my own, which is yet another stitch securing the quilt that is our marriage. So while the Olympic Provisions hot dog, onion rings and other items on the mid-day menu were tempting, when we saw the fresh oysters our decision was made. There were just three on offer that day, all from British Columbia, and while we've been known to scarf down a dozen apiece and hanker for more, a half dozen seemed an adequate sampling on this day. Denman Island: Medium-sized like its siblings, its frilly shell gleaming and pearlescent, we found these sweet and meaty with a fresh brininess. Pearl Bay: Also sweet, this oyster was creamy more than meaty, practically melting on the tongue. Buckley Bay: Much like the Denman Island, though slightly brinier than the other two. All were excellent and provided an intriguing view of the tastes intrinsic to the individual waters from which they came. Tasting notes online suggested that these oysters tend to have a lingering melon or cucumber finish, and we found this to be true as well. As for the beers, my Boneyard Beer IPA proved an excellent counterpoint to the richness of the oysters, clearing my palate between bites. But I was grinding my teeth over not ordering Dave's pick, a glorious pint of darkness, the CDA from Hood River's Pfriem Family Brewers. Roasty, medium-bodied and with a dry hoppiness, it's the ideal foil for raw oysters (or, in my opinion, just about any food) and definitely worth going in to have while its still on the list. Details: Interurban, 4057 N Mississippi Ave. 503-284-6669. Mmmmm, oysters. Thanks for the scoop on EaT's happy hour. The last time I was there, I took my oyster-loving son, and we made our way through quite a few oysters. Better to take him during happy hour! Thanks, Michele! And check back for future visits…there are a couple of happy hours on the list!